Australian shepherd dogs are not only captivating, they are also very popular. Australian shepherds have wonderful characters, fantastic temperaments, and they are loyal and protective. Australian shepherds are very active and sociable, and easily fit into any family or household, but are Australian Shepherds good dogs to own? Australian shepherds are happy dogs that are eager to please. They are very expressive, and will often greet their master with a smile or a pout, which makes them rather endearing dogs to own. They are extremely loyal, and highly protective. They are always at their masters side, constantly underfoot, and are often tripped over as a direct consequence of this trait. They also tend to be rather territorial and quite tenacious, and will ardently protect their turf from strangers. At the same time they are highly social, love the company of people and other dogs, and are generally good with children and other animals. Australian shepherd dogs are well suited to living in a farm environment, but will readily adapt to city life. They need to be included in the family wholeheartedly, as they are great companion dogs who love to tag along in the car when you run errands, or fetch the kids from school. If you work all day, and don’t have the time to devote to an Aussie, then maybe this is not the right dog for you. One needs to study the history of Australian shepherds, to better understand that these are working dogs, bred for herding and protecting sheep, and are thus natural herders and protectors. Consequently, they are good with other animals, including other dogs. However, they are generally quite assertive, and will often quickly establish their dominance, and rapidly rise in rank amongst any other dogs present in the household. Sometimes it is best to let the dogs just sort out the pecking order naturally amongst themselves, but there may be times when intervention is necessary. Australian shepherds are very active dogs, yet they are not ‘busy’ like some other working breeds tend to be. However, they are still working dogs at heart, and as such, need to be given a job to do to prevent boredom. If they are not given a job to do, they will more often than not channel their pent up energy into unsavory behavior such as digging up the garden or chewing. They are extremely agile dogs, and excel at agility, especially jumping – this is great if you are the sporty dog-loving type that would love to compete in dog shows with your Aussie. You can invest in an Agility Starter Kit and perhaps a Doggie Obstacle Course to keep them entertained. However, this must be born in mind when bringing a young Australian shepherd puppy home. They will readily clear a waist high fence, sometimes when they are less than three months old, progressing to clear the stable door to enter or leave the house. So do prepare for this and make sure you have a secure fence of a decent height (minimum height of five feet recommended) to contain your Aussie in your yard. Australian shepherds love water! They will readily jump into any water body, such as a swimming pool, dam, pond or horse water trough, and then run up to their master and shake all over his newly pressed white linen suit – very endearing indeed. But if you enjoy the beach, then an Australian shepherd dog is a great choice for you, as they love to romp on the beach and splash in the surf. Australian shepherds are extremely intelligent, quick learners that can really benefit from a solid training program. An Australian shepherd training program should start with a good foundation training at puppy stage. Equip yourself with a good dog training book so that you can learn how to raise the perfect dog: through puppyhood and beyond , or invest in an online dog training course to help you to understand and correct common dog problems that your Australian shepherd dog may have picked up along the way, to quickly turn your bad dog into a dream dog. Doggy Dan’s dog training methods offer solutions for behavioral problems such as handling dog aggression in Australian shepherd dogs, to behavioral problems such as barking, digging, chewing, and other bad habits that frustrate dog owners. His methods are effective and prove that old dogs can indeed learn new tricks! An alternative approach to conventional dog training methods that is quickly gaining in popularity both for training dogs, as well as other animals such as horses, is Clicker Training. This can be a really effective method of communicating with your pet from a distance without yelling and screaming commands. Australian shepherds are prone to a number of genetically inherited traits that may seriously impact their health, including hip dysplasia, a range of eye defects, epilepsy and MDR-1. Potential owners of Australian shepherds need to be aware of these problems so that they can take precautions when purchasing a puppy. Hip dysplasia is a hereditary defect of the hip resulting in malformation of the hip bones, leading to problems in the hind legs, which can become crippling as the dog develops. This is very common in dogs, and is quite prevalent in Australian shepherds, so when buying a puppy make sure that both parents have been x-rayed and are certified as being free from hip dysplasia. Australian shepherd dogs are prone to a number of different hereditary eye defects, and if you are purchasing an Australian shepherd puppy you should request a copy of both parent dogs’ annual eye screening certification conducted by the Canine Eye Registry Foundation (CERF), which certifies normal vision in dogs. In addition, you can request that the puppy that you are purchasing, be screened to ensure there are no eye defects present. MDR1 is a genetic mutation in this gene that causes some types of collie dogs (including Australian shepherds) that possess the mutant gene, to exhibit sensitivity to certain drugs, including ivomectin, which is commonly used in deworming schedules. Use of problematic drugs when treating dogs with this condition can cause serious neurological reactions, seizures and even death. It is possible to screen your dog for MDR-1 by a running a simple DNA test on a tissue sample (saliva) taken from your dog. 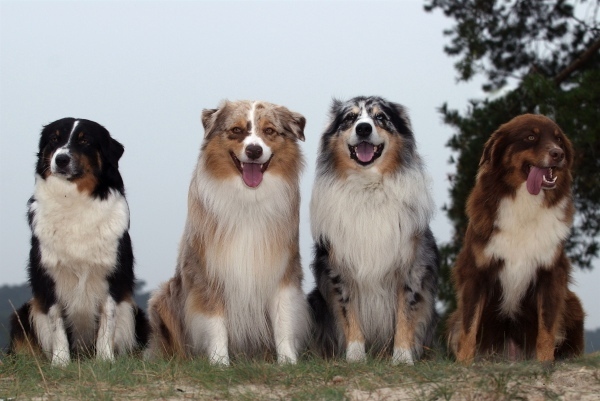 According to the Australian Shepherd Health and Genetics Institute, 32% of Australian shepherd dogs possess at least one copy of the mutant gene. It is recommended that you have your Aussie screened for the mutant gene or alternatively to err on the side of caution and not administer any of the listed drugs known to cause problems with dogs that have MDR1. Australian shepherds are also prone to a number of other genetically inherited diseases, and often suffer from epileptic fits, heart disease, thyroid problems, cancer, and chronic skin allergies. As far as grooming goes, Australian shepherds are relatively easy to maintain. They have a dense undercoat, so daily brushing with a FURminator Long Hair deShedding Tool for Large Dogs is recommended to get rid of loose hair, to prevent shedding and matting. As they are generally active dogs that spend a lot of time outdoors, where they can pick up fleas, regular flea control for Australian shepherds is recommended. Are Australian Shepherds Good Dogs to Own ? By and large Australian shepherds are healthy, happy members of the family, they have great temperaments, and are fairly low maintenance when it comes to grooming. If you are looking for a loyal companion, or active member of the family then Australian shepherds are not good dogs to own – they are great dogs to own! However, care should be taken when choosing an Australian shepherd puppy to avoid heartache and expense later. If you are looking to purchase an Australian shepherd puppy, the Australian shepherd club of America, or United States Australian Shepherd Association are good places to start for advice on breed standards, and what to look for when purchasing a puppy. They also have a list of registered Australian shepherd dog breeders, so can put you in touch with a reputable Australian shepherd breeder. Alternatively, if you wish to consider providing a good home for a needy Australian shepherd contact an Australian shepherd rescue facility that often have Australian shepherds needing new homes.